Hand out a sheet of 12″ x 18″ orange construction paper to each child. 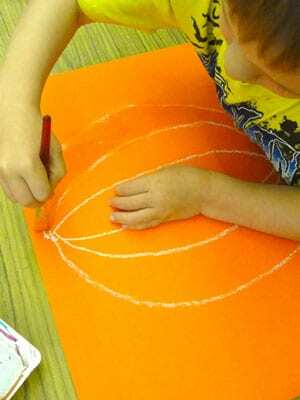 Using a white oil pastel, draw a basic pumpkin: big oval with lines arcing downwards from stem to bottom. Set out three tubs of paint (either in plastic containers or in 6-well palettes). Place brushes in containers or set brushes on a tray. Show the kids how to mix the yellow, orange and red tempera paints together on the pumpkin. They can paint however much of the pumpkin as they want. Once dry, cut out the pumpkin shape. Set aside. Give each student a 4″ x 9″ (approx.) piece of white and one piece (same size) or black construction paper. Fold white paper in half, draw an oval on one side and cut out. Glue eyes to pumpkin. Now draw a large mouth on the black paper and cut out. Glue mouth onto pumpkin. Cut two small circles from black paper and add to oval eyes. Now cut teeth from white paper. Add eyebrows and a nose if you like. Limit instruction as far as facial features go. The less teacher interference, the more fun it is! ARE YOU A SPARKLER? These lessons and over 300 art lessons are available inside the Members Club. Access to videos, resources & trainings for one low monthly fee. Sadly, this is something I can no longer do. No more Halloween projects. Jack O’Lanterns are right out of the picture. No haunted houses, no bats, no witchs, no ghosts, no spooky anything. Holidays have been taken out of the schools entirely here in CT.
Wow, that is really sad J.Cooper! 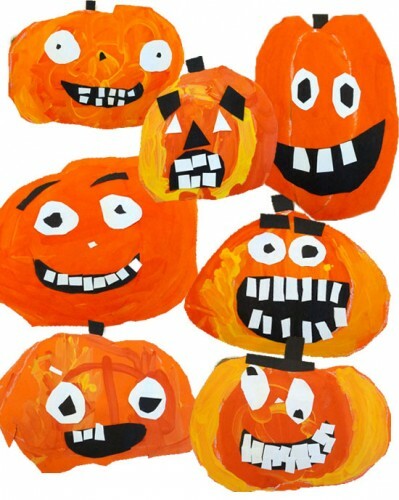 Halloween art projects are so much fun for kids! Thanks for the great idea! I love it! That has to be illegal not to allow pumpkin art during the harvest season. If I were you, I would contact the ACLJ and ask this question. It’s perfectly absurd. This is the first time I’ve done a halloween project…I kind of snuck it in and crossed my fingers. The teachers are usually pretty good to help the students do something else if their religion doesn’t allow teachings of holidays. There are not many of the cases but I usually ask the teacher first. I LOVE this project (just did with my little ones here at home) I LOVE this site! I promote you on my FB page all the time. But I have to admit (as an educator and mother of a child who has food allergies) that it really bums me out when some kids have to do something different than the rest of the class due to safety or religious reasons in public schools. I believe in everyone or no one when it comes to stuff like art projects and food served at parties. But moving on … my very large and diverse school district (181 schools) gets around Halloween by calling it Storybook Character Day. Works for me! Thanks again for this great project idea … my little ones have a great time with it! I respectfully have to disagree with you. Children with food allergies or who have different religious beliefs that may dictate that they cannot participate in holiday celebrations are going to have these differences to contend with their whole life. When they are in college, or in the workplace, or on spring break, or backpacking through Europe, or working with the peace corps (ok, maybe they won’t work with the peace corps, but you know what I mean)…they will constantly find that they are in situations where they may be the odd one out. Teaching them that everybody else is expected to accomodate their allergy/belief does them a great dis-service in my opinion. Instead, we should be teaching our children to be more sensitive to those with differences and discussing them openly instead of not at all. If we start creating classrooms and environments that are steralized and watered down because we are so concerned with people feeling left out then all the ABC’s and 123’s on the planet won’t help them become better citizens. Thanks for sharing your pov, Michelle. And I do post this reply sincerely, and not with any attitude or disrespect. It’s jus that, as an experienced master teacher, I realize that you can easily swap out specific art and food ideas (for whatever the reason) while still maintaining the integrity of the learning standards. Thus, these accommodations cannot be labeled as contributing to a sterilized or watered down learning environment. When it comes to accommodating others, teaching our students to be good citizens is two-fold: recognize why you need to be sensitive, and then take action to be supportive. Believe me, accommodations at school are not doing my child a dis-service. She has ample practice being the odd one out for all of her extra-curricular activities, at private birthday parties, restaurants, vacations … you name it. Did you know that teens are most at risk for food allergy death because they value fitting in more than being safe? It’s worth noting that my daughter’s previous K teacher has the exact same pov as you for accommodating children with food allergies. She openly disagreed with me. Administration disagreed with me. They said “we treat her differently because she is different”. In the end, the Department of Education/Office of Civil Rights stepped in and agreed with me and my child’s doctor. My daughter was given the safe and inclusive environment that she is entitled to by law. I went on to assist the district in drafting comprehensive allergy management guidelines. As a 30 year vet, I’m with Michelle on this one. And, yes, I was a Peace Corps volunteer in Liberia. Our curriculum has changed TREMENDOUSLY since I started teaching: not making cute little pumpkins: unheard of! Now, there are no Halloween or other holiday events and projects? And why is that? It is ABSOLUTELY about catering to the lowest common denominator. A severe food allergy is not what I am talking about: that’s a health issue that needs to be addressed; but not to the point that one child’s condition dictates what everyone else can do. Teachers, AND administrators just cave in to dodge the bullet, why? Fear of lawsuits and repercussions as Jenn has demonstrated. That’s why we shy away from things. What happened to common sense? While the rights of the minority need to be protected; let’s not lose sight that public education is for the greater good of the masses!! That’s sad. We can do Halloween art but for whatever reason we cannot do costumes or parades at my school. That was one of my FAVORITE things as a kid. The costume parade and parents would snap pictures. Fight the power! They’ll take away my spooky art lessons over my cold (un)dead body. I went from a school that wouldn’t really get into the holidays to a school that gets very competitive between the teachers for costuming on Halloween. Halloween is big time here! Can’t wait to use this lesson! Thanks! Yes, this is an extremely fun lesson. I didn’t place the pumpkins on a background, but adding a black paper background makes the project more “finished”. Those pumpkins are soooooo cute …. I will definitely do these pumpkins. Thanks for sharing this great project. i am so glad i found you . i am homeschool mum with not much art experience . i would like my kids to enjoy art . 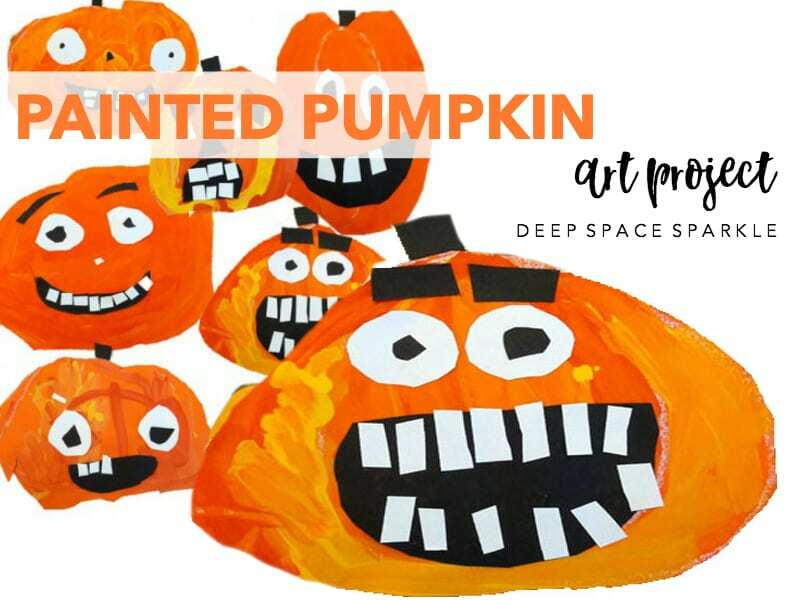 when given a project like this one , do you recommend i show my five years old a finish pumpkin , maybe the photos on your site to inspire her , of course i am not expecting copy work but just looking at what oher kids did can be an inspiration . looking forward to do more of your lessons with my little one s.
Generally speaking, I don’t show a finished project to my students. We all start with a blank piece of paper! I suppose the pictures on my site are for the teachers or adults to get an idea of what to expect from the art lesson. Good luck! I’m wondering about what you just mentioned, about not showing your kids a finished project. I’ve never considered this, I always just assumed the kids would need to see an example. It has me thinking. Maybe you could tell me more about the pros and cons to this method? You know, I rarely talk about this point and up until now, I never really considered why. I have made it a habit of not showing finished projects to my younger students. There are many times I have shown them a finished project to demonstrate a color, a positioning element or a choice in materials, but generally speaking we just dive into the project together. This “rule” of mine is not set in stone but I do consider it carefully when evaluating a lesson. I hope this is enough info to get you thinking, as I feel it might be worthwhile to expand more in a post. Then, we can get others to weigh in on the matter. As a substitute teacher I have used many of your art lessons as fillers in my day. Teachers have come to count on me for bringing along a lesson of my own, so I am deeply indebted to you Patti. I work with k-8th graders and often do the same project with any grade. Showing examples is sometimes really useful and helpful, like with line-drawings with detailed designs. Other times it’s better for them not to see something so they don’t have anyone else’s work to judge their own work against. I have a rule when I do art that no one is allowed to “not like” their project until it is completely finished. This helps kids from freaking out if it’s not turning out the way they think it should or wanting to start over. When they are all done, if they aren’t pleased with it, they can say so, but these cases are usually rare. I’m so glad to hear that you rarely show the kids a finished product. This is the way to truly encourage the art to come from the child. It’s not always easy to do! This is part of the philosophy “process not product” — and it’s so exciting to see what the kids come up with! It feels good to know there are others that consider not showing the children a finished product. I find myself refraining from doing this often. My children are 3-5 years old and I have found that the children will try to “copy” the finished project. What they come up with and how they get there are so much fun to watch. There are some children that need to see what the “whole picture” looks like and I do show those children the finished project… knowing that they just need to know, opposed to wanting it out so that they can copy it. I show them what it looks like and then I put it away. BTW, I’m new to this site and I LOVE it… thank you! Sometimes if it’s a complicated multi-step project I will show a finished product so the kids know the general direction we are aiming at- otherwise they cannot always visualize the finish. It is occasionally a good idea to briefly show the product, then sort of whisk it away so they understand where we’re going but they aren’t able to do a photo copy! Hi thanks for this cute idea. Just a question- why do they paint on orange paper to begin with? Is this in case they leave some areas blank with no paint? I have no idea! I think my thought process at the time was to see how adding similar paint colors would work with a color other than white. Initially I had yellow papers out and then I worried that the pumpkins would look like lemons. So I quickly subbed the yellow for orange. 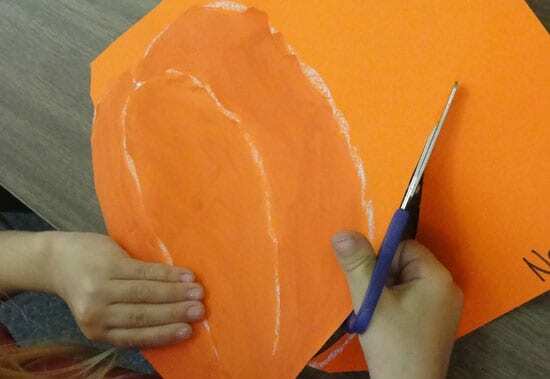 For kinders, it helped as some kids didn’t have enough stamina to paint the whole pumpkin. Glad you picked up on my indecisiveness!!! I just love painting pumpkin don’t you? I am linking this back to my blog as I did a variation with my first graders. Thanks!!! Love the project! I used large yellow construction paper to start and used patterned foam rollers for the students to roll the “warm colors” onto the paper! They were great! Thanks for the great idea! Oh, rollers that would work really well! I cannot believe that CT has taken holidays out of school. That is ridiculous! Some districts in Maine have done the same thing. Teaching holidays does not stifle anyone, or disrespect them. I think its a way to teach about other parts of the world and for people to respect other cultures. Holidays are a way to interpret a society’s belief system and customs and should not be ignored. I have had students who have a religion that restricts all holiday themes. So, for example, pumpkins are not always turned into jack o lanterns. They are used for scarecrow heads, pie…so there should be no reason to not teach how to mix orange by painting a pumpkin. An example, I have a printing project that students use cardboard to print pine trees. Once painted, we discuss where you can find a pine tree. Someone is bound to say Christmas tree. So it is the student artists’ choice to make the tree into what they want. I really think political correctness has gone too far. No holidays, no parties, no this, no that-they are taking it all too far. We needed a quick project for the end of the month and I was happy to find this one. Thanks so much! We talked about analogous colors and I gave the students only red-orange, orange and yellow. They weren’t given water to clean out their brushes between colors so they could experiment with the colors mixing. Instead of the white paper, they used oil pastels in white and green to add accents to their final piece. Very fun! Did this with my kinders and they were AWESOME!! They had so much fun making them and were really proud of the results. I was an art teacher for several years and LOVED your website. Sadly, my district cut the elementary art program last year, so I teach kindergarten now. I love kinder, but I loved ART more! Last year I couldn’t even look at your site because it made me so sad…but I decided to browse today and I’m finding the same wonderful stuff. I still incorporate as much art as I can into my kindergarten class, but it’s very hard to find the time when we have so many other things we’re responsible for teaching. It’s a sad thing, but I am glad to see you still coming up with and *sharing* so many great projects. Thank you! I feel your sadness…I’d be sad too if I couldn’t do art in the classroom anymore. Thanks for coming back…hopefully, you’ll find some shape lessons or literature connections through art. Hi! I am a first year art teacher, and your site has been a wonderful help for me so far! I tried these cute little pumpkins today, and the kids really enjoyed them. Unfortunately my classes are only 25 minutes long, so it’s a real challenge figuring out how far to let them get before I have to start cleanup. As far as the tempera paints go, and perhaps this is pretty basic, but can you explain the best practice for helping the little kinders with mixing the paint on their pumpkins but not in the containers? It seems like there was a separate brush for each container, but once they use one to put the brush to paper, all of the paints end up on all of the brushes, and all of the paints are mixed up in the containers too. That’s okay, but I have a few classes in a row, and I want each class to get to start fresh. Btw, I have about 25 kids in each class too. Any suggestions? Thanks so much Patty! You need to go through the steps one at a time, repeat and make mistakes so children can catch you! Remember, art class is not meant to be perfect, but a place to experiment. 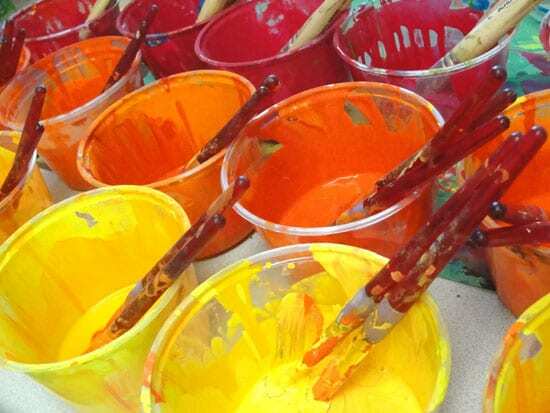 Don’t worry about fresh palettes; use the muffin-style palette and after the class is over you can swipe the messy wells with a sponge and squirt more paint into the wells. I did this this week with my first graders using the 3 warm colors. To paint the stems, I passed out small containers of blue paint and told them to dip their already orange painty brushes into the blue. The stems ended up brown, the kids learned a new way to make brown, and they were quite pleased with themselves. Just an idea……… I added a black crow every other day to the classroom. (9 so far) Not for ‘Halloween’ but for the practice of drawing from ‘life’. Also, one large blue/turquoise pumpkin from the heirloom farmers lot was a hit and last year the apricot pumpkin (15 pounds) reinforced an idea: pumpkins are sorta/kinda ….just like us. All a little bit different.